Having made its debut in a gold-encrusted colorway at Olivier Rousteing‘s NikeLab collaboration, the Roshe Tiempo VI QS was introduced in a trio of new colorways for its general release debut. Now, the hybrid sneaker is subject of another collaborative effort, this time with none other than frequent collaborator SOPHNET. 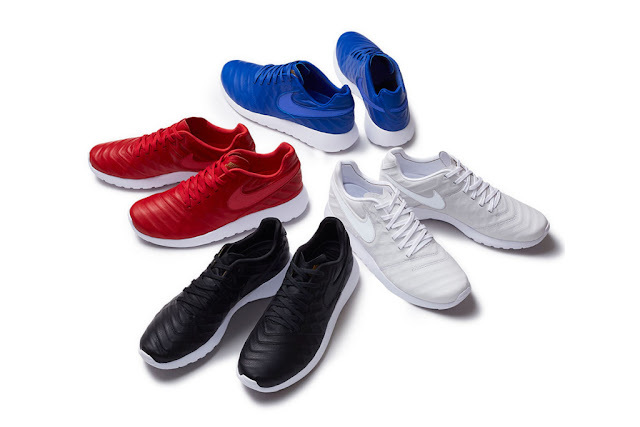 who have offered the new silhouette in four new colorways. Featuring a combination of premium leather and suede, the mashup also boasts tonal branding and lacing, which sit atop of the beloved Roshe midsole. You can purchase all four colorways at Nike’s Harajuku and Fukuoka locations, in addition to the brands’ respective online stores now.